It’s getting dry! A few parts of the field are still wet below the surface, but most of it has gone from pretty well waterlogged a month ago, to dry a couple of inches down, and there’s no rain in sight. The forecast is for heat and sun for the next week at least, with a 60% chance of “showers” on just one day—no holding breath for that. So it’s time to think about spot irrigation. Step 1, finished this afternoon, is to run a water pipe from the well right through the L-shaped garden. 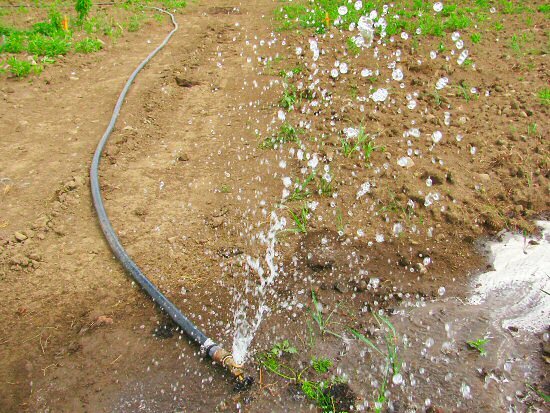 Our watering methods are quite slow and labor-intensive, by hand and with soaker hoses, but on the upside, there’s no huge volume requirement , so the 1″ black plastic pipe already on hand will do fine. Part of the line was already set up, and I added the last 200′ today, for a total of length of about 800′. Taps with quick release connectors are spaced along the line: just plug in a hose as close as possible to where you want to go, drag it out, and there you have it, a little water…everywhere. You have a well? I’m so jealous! It hasn’t rained since March down here, so I have to pay for every drop of water I put on plants. I’m not a hippie like you guys are, but now I’m curious. How can hippies afford to power a well?